A few days ago we have shown you how to block or remove specific category from RSS feeds on your WordPress. 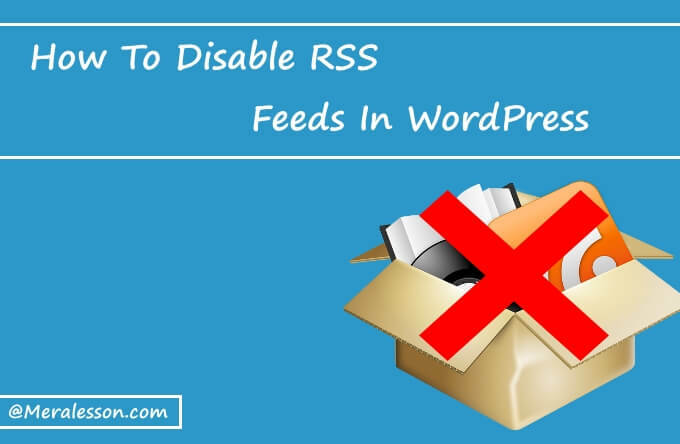 In this tutorial we decided to create tutorial about how to disable or remove RSS feeds in WordPress. This is article is ideal for who want to remove the RSS feeds from WordPress. By default WordPress has no option to remove the RSS feeds but you remove the RSS feed using the popular WordPress plugin. So in this tutorial we will disable the RSS feed in WordPress. We will use Disable Feeds which helps you to disable all types of feeds such as RSS, Atom and RDF. This plugin simply redirects your feeds to the corresponding HTML content. it very useful and very powerful to disable the RSS feeds. More than 20,000 WordPress website and blogs have this plugin. To disable the RSS feeds the first thing that you need to do is download and activate the Disable Feeds through the plugins interface or by upload manually. Still don't know? then read our step by step guide on how to install WordPress plug-ins. Once you have activated the plugin, then your RSS will be disabled. And if you go to your RSS it will redirect to a website page. If want to display 404 not page instead of redirection then go to your WordPress settings >> Reading and scroll down to Disable Feeds Plugin options where you can set an error page instead of redirection. Congratluations, You succefully disabled your WordPress RSS feeds. So this is how easy you can remove the RSS feeds from your WordPress site. We hope this tutorial may help you to disable your WordPress RSS feeds. If you liked this article and wants more qulity tuorials from us then like and follow us on Twitter, Facebook to get latest updates from us.